Russian space enthusiasts poring through photos from NASA's Mars Reconnaissance Orbiter have spotted what looks like the remains of the Soviet Mars 3 lander that arrived at the Red Planet in 1971. The Soviet Union lander was the first spacecraft to survive a Mars landing long enough to transmit data back to Earth. However, after transmitting for just 14.5 seconds after landing on Dec. 2, 1971, Mars 3 went dark for unknown reasons. 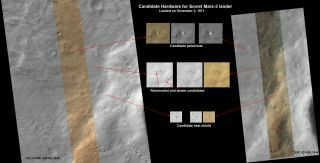 The citizen enthusiasts, led by Vitali Egorov of St. Petersburg, Russia, undertook a crowdsourcing effort to search for the vehicle in photos of the projected landing site from the Mars Reconnaissance Orbiter (MRO), which has been circling Mars since 2006. MRO launched toward the Red Planet in 2005 and is NASA's youngest and most powerful orbiter to study Mars from above. In an image from 2007, they found features that resemble the Mars 3 lander, along with its parachute, heat shield, and terminal retrorocket. The features are the right size and shape for the equipment, and they're arranged in the configuration expected from the mission's entry, descent and landing plan, but it's too early to say for sure whether the photo actually depicts Mars 3. "I wanted to attract people's attention to the fact that Mars exploration today is available to practically anyone," Egorov said in a NASA statement. "At the same time we were able to connect with the history of our country, which we were reminded of after many years through the images from the Mars Reconnaissance Orbiter." A Russian scientists and advisor to the group, Alexander Basilevsky of the Vernadsky Institute of Geochemistry and Analytical Chemistry in Moscow, contacted the MRO team and requested the orbiter take a follow-up image to confirm the features. The satellite's High Resolution Imaging Science Experiment (HiRISE) camera took a second image on March 10 of this year, which confirmed the features. "Together, this set of features and their layout on the ground provide a remarkable match to what is expected from the Mars 3 landing, but alternative explanations for the features cannot be ruled out," said HiRISE principal investigator Alfred McEwen of the University of Arizona. "Further analysis of the data and future images to better understand the three-dimensional shapes may help to confirm this interpretation." Following the Mars 3 mission, the Soviet Union attempted twice more to land spacecraft on the Red Planet with the Mars 6 and Mars 7 missions in 1973, but both of those failed. The first vehicle to survive a landing on Mars was the U.S. Viking 1 lander, which touched down in July 1976.